How would it feel to be able to see our lives from outside and witness our day-to-day routines and life consistently accelerating as we get older; sleeping, working and watching TV, sleeping working and watching TV, ...? 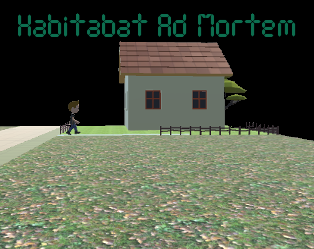 Habitabat Ad Mortem has been created as a life simulation with a call to action and a warning to highlight how easily our routine can dominate our lives. Follow a life knowing how many days there are left to live, seeing each day start to blend with the next unless some action is taken. You can see the affect of an unhealthy diet and lack of exercise on blood sugar, how seeking a promotion can increase blood pressure with the increased hours at the office; your mortgage ever increasing with the interest rates changing throughout the term of the loan. If you were to know all this, what changes would you make to your life?